Home DIY featured My DIY DIY: I`M IN A SEWING MOOD! WHAT SHOULD I DO WITH THESE FABRICS? DIY: I`M IN A SEWING MOOD! WHAT SHOULD I DO WITH THESE FABRICS? One point of my "holiday agenda" apart from reading is sewing! Something I love to do but since I don´t have my own sewing machine in Pforzheim, I only get to do when I am home - and that time is limited during the semester. I also want to incorporate more DIY projects on the blog, because I initially started this blog to share my daily outfits and DIY projects as well - and to be honest, I would love to share more of both, so I am trying hard to make that happen. A couple of days ago, I went on a little fabric shopping spree and came back with three fabrics. 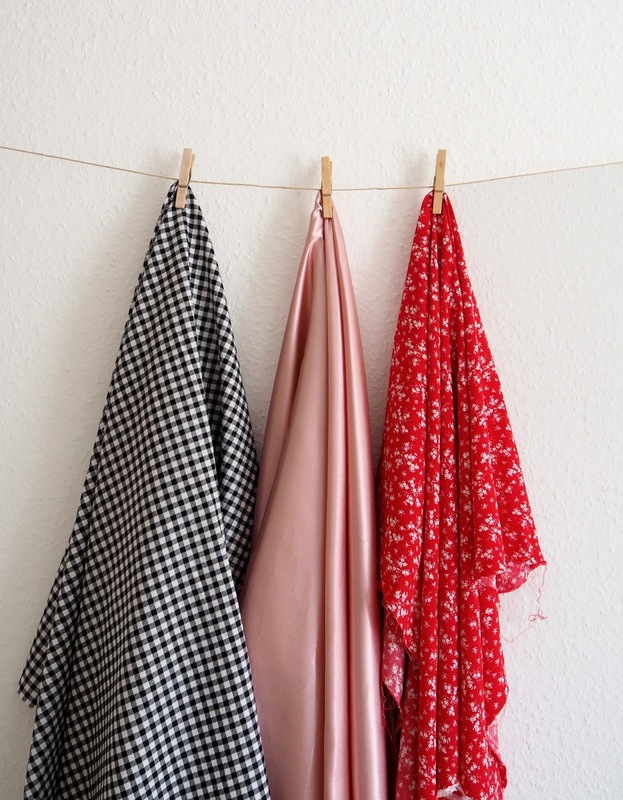 As I want to share with you the whole process of my projects, today, I am giving you an early insight into what I am thinking of creating with these three fabrics. GINGHAM TOP WITH RUFFLES: I have a weakness for anything black and white (that´s also what I blame my always growing collection of striped gartments on), so of course, gingham catched my eye as well. It´s the perfect base for an outfit to add some colorful accessoires. Imagine some black jeans, a gingham top and a bright red bag - love it. 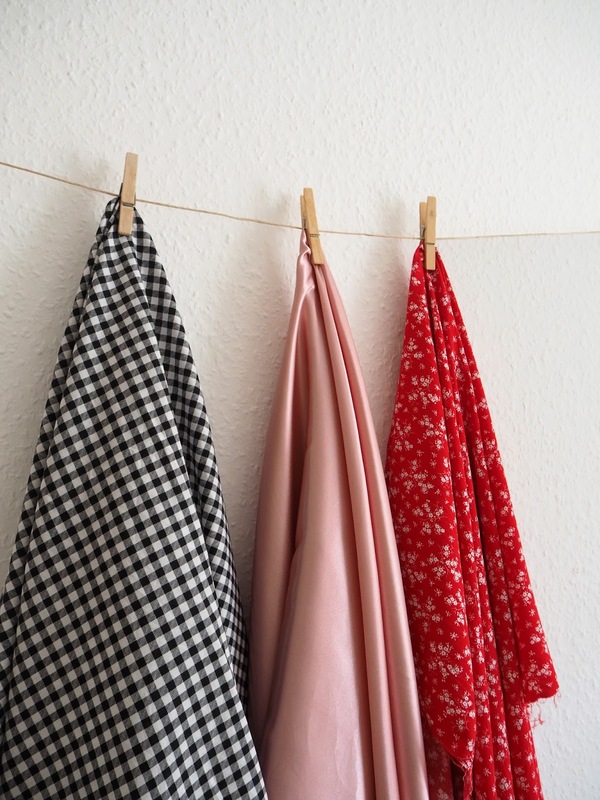 I don´t know how I got through this year so far with owning only 1 item with the classic gingham print, but I am about to make it two. I saw this top the other day and I fell in love. So I am planning on making a similar one, but for much less. Let´s see how this one goes. 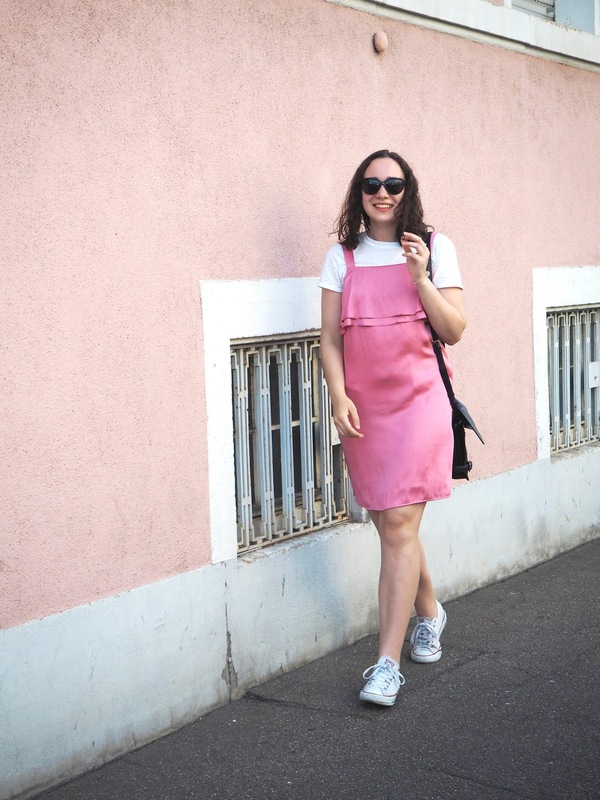 BLUSH PINK CAMISOLE: My love for anything blush pink is no longer a secret and I have various pieces of clothing already covered, but something missing was a blush pink camisole top. I already have a simple black one which I love, so I think a blush pink camisole would be quite easy to make and perfect for hot summer days as well. RED WRAP SKIRT: I think I´ve mentioned before (here) that I would love to have one of those gorgeous wrap dresses from Realisation Par. With a student´s budget, that won´t be possible any time soon, but instead, I thought I could make myself a red printed wrap skirt. I was actually looking for a red fabric with little white stars, but unfortunately, that was nowhere to be found - even on the internet. 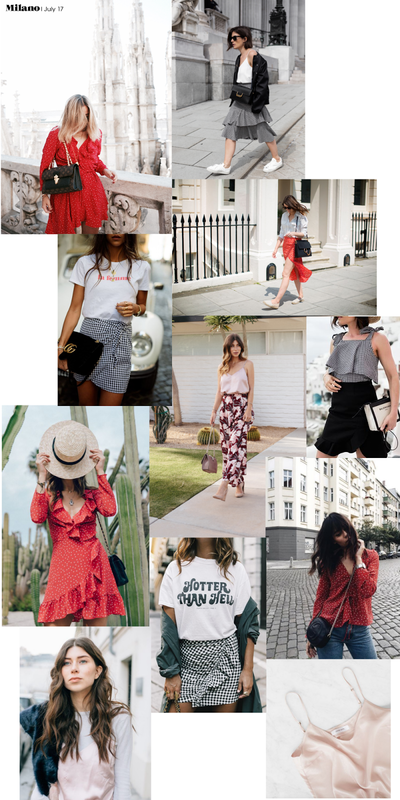 I love the floral print though and I think it will the perfect wrap skirt with ruffles - especially combined with some typical "Julia pieces" such as a white shirt and white converse - don´t you think? What do you think about my ideas? I would love to know what you would like to make out of these fabrics! Ich bin auch echt froh, diese 3 Stoffe gefunden zu haben. Vor allem der rote war echt schwer zu finden, aber jetzt bin ich super happy. Freut mich, dass dir die Ideen gefallen. Gerade ist der Post zum Rock online gegangen und der Rest kommt in den nächsten Wochen.